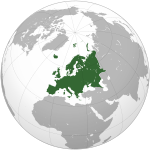 Koninkrijk der Nederlanden (help·info)) is a sovereign state with territory in Western Europe and in the Caribbean. The four parts of the Kingdom—Aruba, Curaçao, the Netherlands, and Sint Maarten—are referred to as "countries", and participate on a basis of equality as partners in the Kingdom. Suriname was a constituent country within the Kingdom from 1954 to 1975, while the Netherlands Antilles were a constituent country from 1954 until 2010. Suriname has since become an independent republic, and the Netherlands Antilles were dissolved into the constituent countries Aruba (since 1986), Curaçao and Sint Maarten (since 2010), and the special municipalities of the Netherlands proper, Bonaire, Saba, and Saint Eustatius. Netherlands New Guinea was a dependent territory of the Kingdom until 1962, but was not an autonomous country, and was not mentioned in the Charter. Before the Charter for the Kingdom of the Netherlands was proclaimed in 1954, Suriname, Netherlands New Guinea, and the "Netherlands Antilles", formerly "Colony of Curaçao and subordinates" (Kolonie Curaçao en Onderhorige Eilanden) were colonies of the Netherlands. The Kingdom of the Netherlands finds its origin in the aftermath of Napoleon's defeat in 1813. In that year the Netherlands regained its freedom and the Sovereign Principality of the Netherlands was proclaimed with William Prince of Orange and Nassau as sovereign. Reunification with the Southern Netherlands, (roughly equivalent to what is now Belgium and Luxembourg) was decided in 1814. In March 1815 the Sovereign Prince adopted the style of a King of the Netherlands and the Kingdom had come into being. The King of the Netherlands was also Grand Duke of Luxembourg, a province of the Kingdom that was at the same time a Grand Duchy of the German Confederation. The origin of the administrative reform of 1954 was the December 7, 1942 radio speech by Queen Wilhelmina pertaining to the August 14, 1941 Atlantic Charter, which was signed by the Netherlands on January 1, 1942. In this speech the Queen, on behalf of the Dutch government in exile in London, expressed a desire to review the relations between the Netherlands and its colonies after the end of the war. After the liberation, the government would be calling a conference to agree on a settlement in which the overseas territories could participate in the administration of the Kingdom on the basis of equality. Initially, this speech had propaganda purposes; the Dutch government had the Dutch East Indies (now Indonesia) in mind, and was hoping to appease public opinion in the United States, which had become skeptical towards colonialism. After Indonesia became independent, a federal construction was considered too heavy as the economies of Suriname and the Netherlands Antilles were insignificant compared to those of the Netherlands. In the Charter, as it came about in 1954, Suriname and the Netherlands Antilles each got a Minister Plenipotentiary based in the Netherlands, who had the right to participate in Dutch cabinet meetings when it discussed affairs that applied to the Kingdom as a whole, when these affairs pertained directly to Suriname and / or the Netherlands Antilles. Delegates of Suriname and the Netherlands Antilles could participate in sessions of the First and Second Chamber of the States-General. An overseas member could be added to the Council of State when appropriate. According to the Charter, Suriname and the Netherlands Antilles were also allowed to alter their Basic Laws (Staatsregeling). The right of the two autonomous countries to leave the Kingdom unilaterally was not recognised; yet it was stipulated the Charter could be dissolved by mutual consultation. In 1969, an unorganised strike on the Antillian island of Curaçao resulted in serious disturbances and looting, during which a part of the historic city centre of Willemstad was destroyed by fire. Order was restored by Dutch marines. The same year in Suriname saw serious political instability with the Surinamese prime minister, Jopie Pengel, threatening to request military support to break a teacher strike. In 1973, a new Dutch cabinet under Labour leader Joop den Uyl assumed power. In the government policy statement the cabinet declared a wish to determine a date for the independence of Suriname and the Netherlands Antilles with the government of those nations. The Antillean government was non-committal; the same held for the Surinamese Sedney cabinet (1969–1973). The Suriname 1973 elections brought the National Party Combination (Nationale Partij Kombinatie) to power, with Henck Arron as its prime minister. The new government declared on its instatement that Suriname would be independent before 1976. This was remarkable, as independence had not been an issue during the election campaign. The Den Uyl-government in The Hague now had a willing partner in Paramaribo to realise its plans for Surinamese independence. Despite vehement and emotional resistance by the Surinamese opposition, Den Uyl and Arron reached an agreement, and on 25 November 1975, Suriname became independent. The Kingdom of the Netherlands currently consists of four countries that form part of the Kingdom of the Netherlands on a basis of equality. * The country of the Netherlands did not include Bonaire, Saba or Saint Eustatius until 10 October 2010. The statistics show what they would have been, had Bonaire, Saba and Saint Eustatius been a part of the Netherlands on 1 January 2010. Aruba is a centralised unitary state. Its administration consists of the Governor, who represents the Monarch, and the (Aruban) Council of Ministers, headed by a Prime Minister. The people are represented in the Estates of Aruba. The current Governor of Aruba is Fredis Refunjol, and the current Prime Minister is Mike Eman. It has the Aruban florin as its currency. Curaçao is a centralized unitary state, with similar administrative characteristics to Aruba. It has the Netherlands Antillean guilder as its currency. The Netherlands is a representative parliamentary democracy organized as a unitary state. Its administration consists of the Monarch and the Council of Ministers, which is headed by a Prime Minister. The people are represented by the States-General of the Netherlands, which consists of a House of Representatives and a Senate. The Netherlands is divided into 12 provinces: Drenthe, Flevoland, Friesland, Gelderland, Groningen, Limburg, Noord-Brabant, Noord-Holland, Overijssel, Utrecht, Zeeland and Zuid-Holland. The provinces are divided into municipalities. The current Prime Minister of the Netherlands is Mark Rutte. It has the euro as its currency, except in the special municipalities of the BES islands in the Caribbean, where the Netherlands Antillean guilder has been replaced by the US dollar in 2011. The special municipalities of Bonaire, Saint Eustatius and Saba are part of Netherlands but do not form part of a province. They resemble ordinary Dutch municipalities in most ways (with a mayor, aldermen and a municipal council, for example) and are subject to most Dutch laws. Residents of these three islands are also able to vote in Dutch national and European elections. There are, however, some derogations for these islands. Social security, for example, is not on the same level as it is in the Netherlands. In November 2008 it was decided to introduce the US dollar in the three islands. The date of introduction was 1 January 2011. The Netherlands carries the risk of exchange rate fluctuations regarding cash flows between the state and the islands. Sint Maarten is a centralized unitary state, with similar administrative characteristics to Aruba. It has the Netherlands Antillean guilder as its currency. The Constitutions of the Netherlands, Aruba, Curaçao, and Sint Maarten regulate the governance of their respective countries, but are subordinate to the Charter for the Kingdom of the Netherlands. The Netherlands Constitution also constitutes and regulates the institutions of the Kingdom that are mentioned in the Charter. The provisions in the Charter for these institutions are additional and are applicable for only the affairs of the Kingdom as described in the Charter, when they affect Aruba, Curaçao, or Sint Maarten directly. In cases where affairs of the Kingdom do not affect Aruba, Curaçao, or Sint Maarten, they are dealt with according to the provisions laid down in the Netherlands Constitution. In these cases the Netherlands acts alone, according to its constitution and in its capacity as the Kingdom of the Netherlands. The other three countries cannot do the same for affairs of the Kingdom that only pertain to them and not to the Netherlands proper. In these cases, the provisions of the Charter prevail. Changes in the Charter for the Kingdom of the Netherlands can only be made when all countries agree. The Monarch and her Ministers form the Government of the Kingdom. According to Article 7 of the Charter, the Council of Ministers of the Kingdom of the Netherlands consists of the Council of Ministers of the Netherlands complemented by one Minister Plenipotentiary of Aruba, one Minister Plenipotentiary of Curaçao, and one Minister Plenipotentiary of Sint Maarten. The Dutch Prime Minister chairs the Council of Ministers of the Kingdom. The Government and the Council of Ministers of the Kingdom, along with the monarchy itself, are subject to Article 5 of the Charter that refers their regulation mainly to the Constitution for the Kingdom of the Netherlands as far as the Charter for the Kingdom of the Netherlands does not provide for that. However, the two roles these institutions have in the Netherlands proper and the Kingdom as a whole, are judicially separate. The King or Queen of the Netherlands is the head of state of the Kingdom. The King is represented in Aruba, Curaçao, and Sint Maarten by a governor. The legislature of the Kingdom consists of the States-General of the Netherlands and the Government. Articles 14, 16 and 17 of the Charter give some participation to the parliaments of the Aruba, Curaçao, and Sint Maarten. In case of a conflict between a country and the Kingdom, Article 12 of the Charter prescribes a administrative reconciliation procedure. This was often deemed a democratic deficit of the Kingdom, leading to the adoption of an amendment to the Charter, which entered into force on 10 October 2010. The new Article 12a specifies that in addition to the administrative reconciliation procedure, "by Kingdom Act measures shall be made allowing for the arbitration of certain conflicts, as specified by Kingdom Act, between the Kingdom and the countries." The imperative formulation was the result of an amendment in the Chamber of Representatives by special delegates Evelyna Wever-Croes and J.E. Thijsen of Aruba; the original formulation was "by Kingdom Act measures can be made". The safeguarding of [fundamental human] rights and freedoms, legal certainty and good governance shall be a Kingdom affair. These Kingdom affairs are only taken care of by the Kingdom government, however, if the affair affects Aruba or the Netherlands Antilles. Article 14, paragraph 3, of the Charter, foresees the handling of Kingdom affairs in all other cases by the Netherlands. On the basis of Article 38, the countries of the Kingdom can decide to adopt a Kingdom Act outside of the scope of the aforementioned Kingdom affairs. Such acts are referred to as Consensus Kingdom Acts, as they require the consent of the parliaments of Aruba and the Netherlands Antilles. The Kingdom negotiates and concludes international treaties and agreements. Those that do not affect Aruba, Curaçao, and / or Sint Maarten directly are dealt with by the provisions of the Constitution (in fact by the Netherlands alone). Article 24 of the Charter specifies that when an international treaty or agreement affects the Aruba, Curaçao, or Sint Maarten, the treaty or agreement concerned shall be submitted to the representative assemblies of the Aruba, Curaçao, or Sint Maarten. The article further specifies that when such a treaty or agreement is submitted for the tacit approval of the States-General of the Netherlands (Dutch: Staten-Generaal der Nederlanden), the Ministers Plenipotentiary may communicate their wish that the treaty or agreement concerned shall be subject to the express approval of the States-General. Article 25 gives Aruba, Curaçao, and Sint Maarten the opportunity to opt-out from an international treaty or agreement. The treaty or agreement concerned then has to specify that the treaty or agreement does not apply to Aruba, Curaçao, or Sint Maarten. Most scholars agree that it is difficult to group the constitutional arrangements of the Kingdom in one of the traditional models of state organization, and consider the Kingdom to be a sui generis arrangement. Instead, the Kingdom is said to have characteristics of federal state, a confederation, a federacy, and a devolved unitary state. Characteristics that point more or less to a federacy include the fact that the functioning of the institutions of the Kingdom is governed by the Constitution of the Netherlands where the Charter doesn't provide for them. The Charter also doesn't provide a procedure for the enactment of Kingdom acts; articles 81 to 88 of the Constitution of the Netherlands also apply for Kingdom acts, be it with some additions and corrections stipulated in articles 15 to 22 of the Charter. The only Kingdom institution that requires the participation of the Caribbean countries in a mandatory way is the Council of Ministers of the Kingdom; both the Supreme Court and the Council of State of the Kingdom only include Caribbean members if one or both Caribbean countries ask for it, and the Caribbean countries are almost completely excluded from participating in the Kingdom's legislature. They can, however, participate in the drafting of a Kingdom act and their Ministers Plenipotentiary can oppose a Kingdom act otherwise supported by the Kingdom government in front of the Kingdom's parliament. Furthermore, according to article 15 of the Charter, the Ministers Plenipotentiary can request the Kingdom parliament to introduce a draft Kingdom act. Last, but not least, the Netherlands can, according to article 14 of the Charter, conduct Kingdom affairs on its own if conducting such affairs doesn't affect Aruba, Curaçao, or Sint Maarten. Aruba, Curaçao, and Sint Maarten do not have this right. Constitutional scholar C.A.J.M. Kortmann speaks of an "association of countries that has characteristics of a federation, yet one of its own kind." Belinfante and De Reede do speak about a "federal association" without any reservations. Despite being of a sui juris constitutional nature, some other states have similar properties. In particular, the Kingdom of Denmark consists of Denmark, Greenland and the Faeroe Islands (see also Rigsfællesskabet), while the Realm of New Zealand consists of New Zealand, the Cook Islands, Niue, Tokelau and the Ross Dependency. These comparisons are not exact; for instance, aside from the Queen of New Zealand, there is no constitutional structure shared between New Zealand, the Cook Islands and Niue. Other states also include multiple territories, but are distinct. Some states, as the United Kingdom and its overseas territories or the United States and its insular areas, do not consider their external territories as integral parts of the state. In other states, such as the Commonwealth of Australia, do treat their external territories as integral components, but have only one country/nationality level equivalent to the state. The Kingdom of the Netherlands is a member state of the European Union. Although originally both Suriname and the Netherlands Antilles were explicitly excluded from association with the European Economic Community by means of a special protocol attached to the Treaty of Rome, the status of Suriname as an overseas country (OCT) of the Community was established by a Supplementary Act completing the instrument of ratification of the Kingdom of the Netherlands on 1 September 1962. The Convention on the association of the Netherlands Antilles with the European Economic Community entered into force on 1 October 1964, signalling the attainment of OCT status by the Netherlands Antilles. Currently, all Caribbean islands, including the BES islands that are part of the Netherlands proper, are OCTs. Since citizenship is a Kingdom affair, and is thus not distinguished for the four countries, citizens from all four countries are also citizens of the European Union. In 2004, a joint commission proposed major reforms for the Netherlands Antilles. On October 11, 2006 and November 2, 2006, agreements were signed between the Dutch government and the governments of each island that would put into effect the commission's findings by December 15, 2008. The reform happened on 10 October 2010. Under these reforms, both Curaçao and Sint Maarten form new constituent countries within the Kingdom of the Netherlands, thereby dissolving the Netherlands Antilles. The BES islands Bonaire, Saba, and Saint Eustatius became direct parts of the Netherlands as special municipalities of the Netherlands and were constituted as "public bodies" (Dutch: openbare lichamen) under the Constitution for the Kingdom of the Netherlands. These municipalities resemble ordinary Dutch municipalities in most ways (they will have mayors, aldermen, and municipal councils, for example) and will have to introduce most laws of the Netherlands. As a transitional measure, only Dutch law that is considered to be necessary to function within the legal system of the Netherlands was introduced, and most current laws of the Netherlands Antilles were still in force on the three islands once they joined the Netherlands on 10 October 2010. Since that date, Dutch legislation is to slowly take the place of the current laws of the Netherlands Antilles on those three islands. There are, however, some derogations for these islands, due to their distance. Social security, for example, will not be on the same level as it is in the Netherlands, and it is not certain whether the islands will be obliged to introduce the euro. The special municipalities will be represented in the affairs of the Kingdom by the Netherlands, as they can vote for the Dutch parliament. As the current Dutch voting law specifies that the Senate is to be chosen by the provinces, and the three islands currently are not to be included in a province, it is as yet unsure how they are to elect members in the First Chamber. The Dutch government has, however, guaranteed that the people on the islands will be able to elect members of the First Chamber, and is considering options for this. For Bonaire, Saba, and Saint Eustatius, the Netherlands has proposed that a study be conducted on the islands acquiring the status of Outermost Regions (OMR), also called Ultra Peripheral Regions (UPR). The study would also look into how the islands would fare under UPR status. Outside the Kingdom of the Netherlands, "Netherlands" is used as the English short-form name to describe the Kingdom of the Netherlands. At the United Nations, for example, the Kingdom is identified in the General Assembly by its English short-form name "Netherlands", whereas the English long-form name "Kingdom of the Netherlands" may be used in place of the name "Netherlands" in formal UN documentation. International treaties, also, frequently shorten "Kingdom of the Netherlands" to "Netherlands." The Dutch name that is commonly used is Nederland, which is a singular form, whereas both the official Dutch name Koninkrijk der Nederlanden and the English "(Kingdom of the) Netherlands" is a plural form. In Dutch practice, however, "Kingdom of the Netherlands" is shortened to "Kingdom" and not to "Netherlands", as the latter name could be confused with the Kingdom's principal country rather than with the Kingdom in its Charter capacity. The Charter for the Kingdom of the Netherlands also shortens "Kingdom of the Netherlands" to "Kingdom" rather than to "Netherlands". Talking about the negotiation tactics of then Minister for Kingdom Affairs Alexander Pechtold, ChristenUnie leader and current demissionair Deputy Prime Minister of the Netherlands André Rouvoet illustrated the sensitivity in this matter by remarking in the House of Representatives that "[...] the old reproof that constantly characterised the relationship between the Netherlands and the Antilles immediately surfaced again. The Netherlands identifies the Kingdom with the Netherlands and dictates. The Netherlands Antilles can either give in or be ruled upon." In addition, the Werkgroep Bestuurlijke en Financiële Verhoudingen Nederlandse Antillen—the commission that explored the current constitutional reform of the Kingdom—recommended that the "identification of the Netherlands with the Kingdom needs to be eliminated". The Council of State of the Kingdom joins the commission in this by remarking that the Kingdom of the Netherlands has no telephone number, no budget and that the Council of Ministers of the Kingdom usually meets very briefly with a summary agenda. To counter this habit, the Council of State has suggested that with the pending constitutional reform in the Kingdom, a Secretariat for the Kingdom will be instituted that prepares the agenda for the Council of Ministers of the Kingdom and guards the enforcement of decisions of the Council. The Kingdom of the Netherlands covers 42,519 square kilometres (16,417 sq mi), making it the 135th largest country on earth. The Kingdom of the Netherlands has land borders with Belgium, Germany (both in the Netherlands), and France (on Sint Maarten). About one quarter of the Netherlands lies below sea level, as much land has been reclaimed from the sea. Dikes were erected to protect the land from flooding. Previously, the highest point of the Netherlands was the Vaalserberg in Limburg at only 322.7 metres (1,053 ft), but with the constitutional reform of 10 October 2010 this changed as Saba became part of the Netherlands as a special municipality, and its Mount Scenery (877 metres (2,877 ft)) took the place of the Vaalserberg. The Caribbean parts of the Kingdom consist of two zones with different geographic origins. The Windward Islands (Saba, Saint Eustatius and Sint Maarten) are all of volcanic origin and hilly, leaving little ground suitable for agriculture. The Leeward Islands (Aruba, Bonaire and Curaçao) have a mixed volcanic and coral origin. The Caribbean islands have a tropical climate, with warm weather all year round. The Windward Islands are subject to hurricanes in the summer months. The Netherlands has a moderate maritime climate, with cool summers and mild winters. Papiamento is an official language in the Caribbean part of the Kingdom</small>. English is an official language on the islands of Bonaire, Saba and Saint Eustatius, as well as Sint Maarten. Spanish, though not among the official languages, is widely spoken on the islands. In Friesland, the West Frisian language has a formal status. Dutch Low Saxon and Limburgish are officially recognised as regional languages in the Netherlands. The Hague is the seat of the government of the Netherlands; Oranjestad is the capital of Aruba; Willemstad is the capital of Curaçao; and Philipsburg is the capital of Sint Maarten. ^ The Prime Minister of the Netherlands is referred to as "Our Prime Minister, in his capacity as chairman of the Council of Ministers of the Kingdom" (Dutch: Onze Minister-President, in zijn hoedanigheid van voorzitter van de raad van ministers van het Koninkrijk) when he acts as a Minister of the Kingdom. An example of this can be found in article 2(3a) of the Kingdom Act on financial supervision for Curaçao and Sint Maarten. Other ministers of the Netherlands are referred to with the additional line "in his capacity as Minister of the Kingdom" (Dutch: in zijn hoedanigheid van Minister van het Koninkrijk) when they act as Kingdom Ministers, as for example with "Our Minister of Justice in his capacity as Minister of the Kingdom" (Dutch: Onze Minister van Justitie in zijn hoedanigheid van minister van het Koninkrijk), except for the Minister of Foreign Affairs and the Minister of Defence, since they always act in a Kingdom capacity. For more information on this, see Borman 2005 and Borman 2010. ^ a b Peter Meel, Tussen autonomie en onafhankelijkheid. Nederlands-Surinaamse betrekkingen 1954-1961 (Between Autonomy and Independence. Dutch-Surinamese Relations 1954-1961; Leiden: KITLV 1999). ^ Gert Oostindie and Inge Klinkers, Knellende Koninkrijksbanden. Het Nederlandse dekolonisatiebeleid in de Caraïben, 1940-2000, II, 1954-1975 (Stringent Kingdom Ties. The Dutch De-colonisation Policy in the Caribbean; Amsterdam: University Press 2001). ^ "31.954, Wet openbare lichamen Bonaire, Saint Eustatius en Saba" (in Dutch). Eerste kamer der Staten-Generaal. http://www.eerstekamer.nl/wetsvoorstel/31954_wet_openbare_lichamen. Retrieved 2010-10-15. "De openbare lichamen vallen rechtstreeks onder het Rijk omdat zij geen deel uitmaken van een provincie. (The public bodies (...), because they are not part of a Province)"
^ a b "Aruba and the Netherlands Antilles: Political relations within the Kingdom of the Netherlands". Ministerie van Binnenlandse Zaken en Koninkrijksrelaties. Archived from the original on 2008-02-17. http://web.archive.org/web/20080217222203/http://www.minbzk.nl/bzk2006uk/subjects/aruba-and-the. Retrieved 2007-10-13. ^ a b c d e f H.G. Hoogers (2008) "De landen en het Koninkrijk", in Schurende rechtsordes: over juridische implicates van de UPG-status voor de eilandgebieden van de Nederlandse Antillen en Aruba, Groningen: Faculteit rechtsgeleerdheid van de Rijksuniversiteit Groningen, pp. 119-124. This study was mandated by the Dutch State Secretary for Kingdom Relations and was used for government policy. ^ "De in het statuut neergelegde staatsvorm heeft een uniek karakter en is moeilijk in een bepaalde categorie onder te brengen [...] Veelal wordt dan ook geconcludeerd dat het Koninkrijk niet van een duidelijke classificate kan worden voorzien. Gesproken wordt van een quasi-, dan wel pseudo-federatie of van een constructie sui generis", in: C. Borman (2005) Het Statuut voor het Koninkrijk, Deventer: Kluwer, pp. 23-24. ^ "associatie van landen die trekken heeft van een federatie (Bondsstaat), maar wel een eigensoortige", in: C.A.J.M. Kortmann (2005) Constitutioneel recht, Deventer, p. 107. This page uses content from the English language Wikipedia. The original content was at Kingdom of the Netherlands. The list of authors can be seen in the page history. As with this Familypedia wiki, the content of Wikipedia is available under the Creative Commons License.